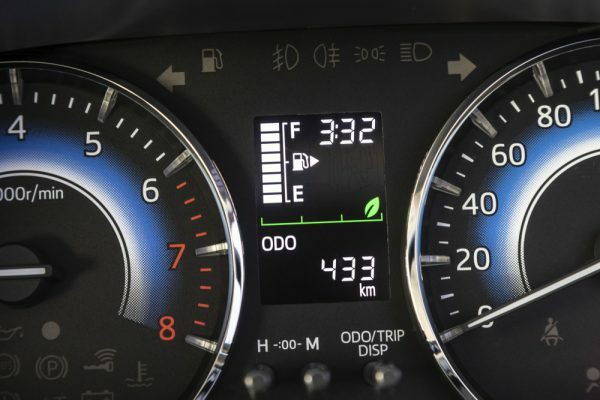 The Rush slots slots between the Fortuner and the Avanza. 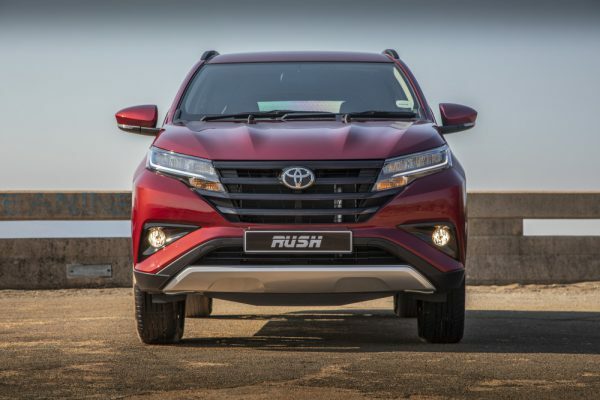 Toyota is entering the small SUV segment with its new Rush which slots between the Fortuner and the Avanza. Toyota says the Rush is set to cater to the ‘new age’ urban adventurer and encourages customers to start their own adventure. On the outside, it features a prominent angular design with pointed, upswept LED headlamps and large trapezoidal grille. An inverted contour line separates the upper and lower air-dams and creates a triangular space which house the fog lamps. A silver-hued skid plate and twin hood bulges round off the front façade. The rear design centres on the LED-equipped rear lamp clusters, which carry strong horizontal lines and a similarly inverted contour line flowing from the bumper to the rear diffuser area. Buyers have a choice of five exterior colours namely; Tusk White, Quicksilver, Ruby Metallic, Liquid Bronze Metallic and Graphite Black. On the inside, you get a strong symmetrical design with ease-of-use operational zones focusing on excellent ergonomics. You get three more cupholders, accessible from both front and second row seats, whilst a 6,4-litre glove compartment and driver-side storage binnacle, place items out of sight. 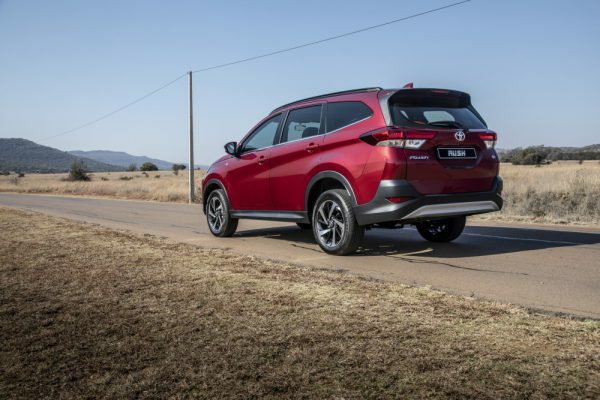 A cavernous 609 litres of luggage capacity is provided, if you think that is not enough, you can fold down the rear seats thus increasing more cargo space. Safety is rest assured. 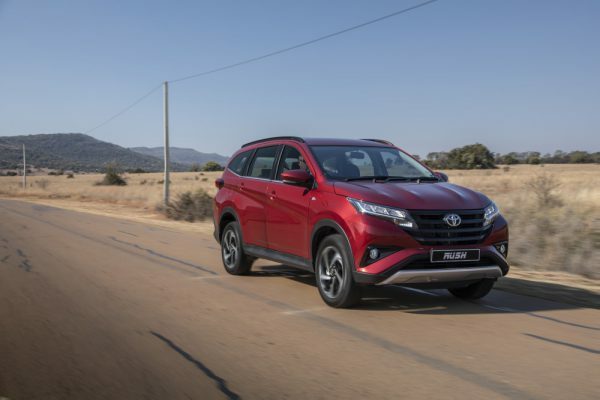 You get Vehicle Stability Control, Anti-lock Braking System and Hill Assist Control plus a total of six airbags – driver, passenger, side and curtain airbags are provided. 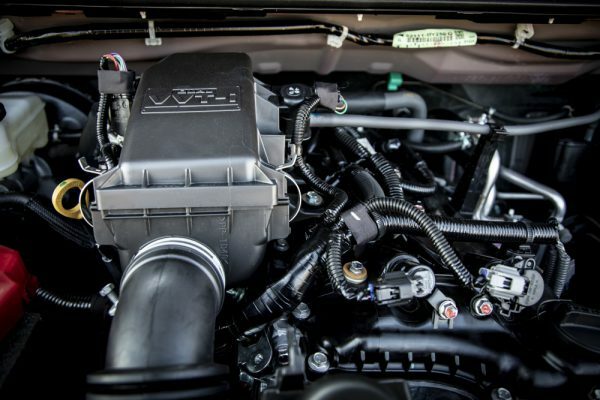 Power comes from a 1.5-litre four-cylinder DOHC engine, with outputs of 77 kW at 6000 rpm and 136 Nm of torque at 4200 rpm. Customers have a choice of either a 5-speed manual transmission or 4-speed automatic driving the rear wheels. 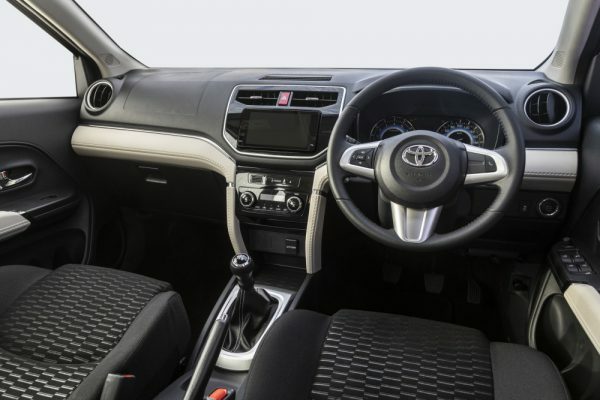 Toyota says the Rush, in manual transmission guise will return 6.6 litres per 100km, 6.7 litres per 100km for the automatic. The CO2 figures are 156 and 158 g/km respectively.